Vial containing 12 ml and 30 ml. The maximum strength non-steroidal anti-inflammatory, analgesic and antipyretic. Non-steroidal anti-inflammatory, analgesic and antipyretic injection, for large animals, with a strength equivalent to morphine. Each ml. contains: Flunixín base (as meglumine) 50 mg; auxiliary agents and vehicle q.s. Equines/Horses: Relief in pain associated to inflammatory lesions of the locomotive system: myositis, arthritis, osteitis, tendonitis, sinovitis, etc. Relief of visceral pain in colics. Horses: In case of inflammatory injuries of the locomotive system the dose to be applied is 1,1 mg of Flunixin/day/kilo of live weight (1 mL of Aplonal 5% per every 45 kilos of weight) through intramuscular or intravenous route. 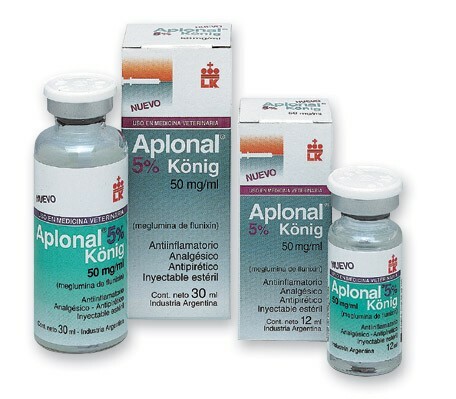 In case of colics administer, through intravenous route, 1,1 mg of Flunixín / kilo of live weight (1 ml of Aplonal 5% per every 45 kilos of weight); the application may be repeated up to 3 times at 30 minutes intervals if there is no improvement.